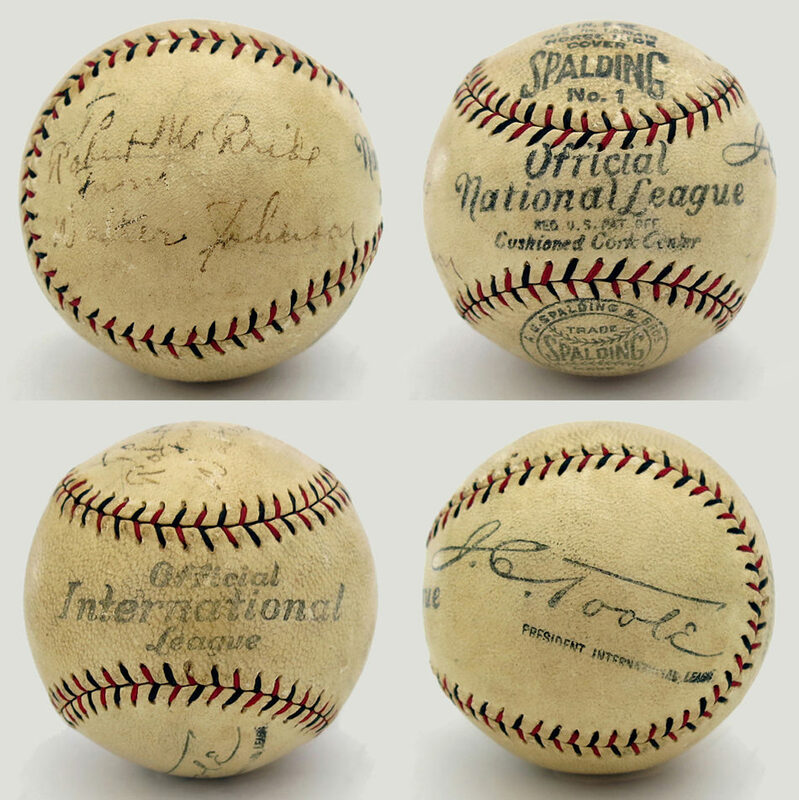 Anyone want to take an educated guess where this Walter Johnson ball would land if auctioned via REA, Heritage, etc? I've looked through realized prices for single signed WJs and of course they are all over the places depending on the specifics of each signature and the actual ball it was signed on. -Some relative signature lightness in spots. -The ball is ONL/Int'l League from 1928, the one year Walter Johnson managed (and even had a few pinch at-bats) at Newark. -The ball is in nice condition. -The personalization has association to Walter Johnson's career. George McBride was Walter's teammate for 13 years and when Walter signed as manager at Newark he asked George McBride to be a coach. George had Walter sign this ball to his young nephew sometime that year. This ball is mine and I'm not selling, but it's not directly in my collecting wheelhouse...so is something I'd possibly trade if a scenario came up, and I'd like to know how I should be thinking about it re: value. That's a nice piece. I'll defer to some better single signed ball collectors and Johnson experts. My best guess would be in the $1,500-2,000 range. By the way, if anyone has a similar decent looking WJ single signed for sale in the $1500-$2000 range, let me know. I might be a buyer. Since I mentioned it in my original post, here's the box score from Walter Johnson's last appearance in a pro game, putting himself in to pinch hit in the 9th. Then be sure to keep a look out at Heritage. Similar ones in the price range hit there about twice a year. Last edited by packs; 02-06-2018 at 08:28 AM. I'm not sure the "slightly worse" SCP/Helms example is a 1:1 comparison if you're trying to make a point. That ball has significant damage exactly on the sweet spot and if you didn't know it you might not be able to tell the signature reads "Johnson". On the whole, the ball I have- as any old run-of-the-mill ho-hum Walter Johnson signed baseball, and as an object of baseball history- is in a better class. Thanks though. I do appreciate opinions, which is why I asked. Why don't you decide how much it's worth then? Your ball is not a pristine example. Most of Walter has flaked off on your baseball as well. I'd expect to pay between $1,500 and $2,000 for it. I wouldn't be persuaded to pay more based on its history. Last edited by packs; 02-06-2018 at 09:30 AM. A bit lighter signature. Personalized. Side panel. OAL ball. Ball in better shape than yours. Side panel. No personalization. Signature about as dark as yours, possibily a touch moreso. OAL ball. Ball itself in rough shape but panel with the signature not too bad. Similarly alternating flaky and bold as is yours. OAL ball. Sweet spot. Ball in as nice shape as yours. Sweet spot signature. No personalization. Not an OAL ball. Ball in better shape than yours. Signature slightly lighter overall than yours but no flaking. Thanks. I saw those before I posed my question. I guess I was thinking there might be other factors that might go into valuing this particular ball. That's the question I was really asking. But I guess not, and that's fair enough. I got my answer. I am curious as to what factors you felt would make this ball more valuable/desirable than the others of the same signature quality? None of the information you posted seems to me to be particularly historic in nature. Perhaps if you could pinpoint the ball to being from a specific game of particular interest it would boost the value up. Certainly if you could prove it was from his last pro game, you could definitely expect a higher return. I think being inscribed to Geo McBride's son is cool, but not enough for most to pay a significant premium except for someone who collects McBride or, perhaps, a relative of his.